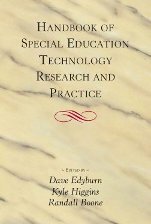 The first authoritative, comprehensive, single-volume reference book documenting the latest research and practice developments in special education technology. Contains 41 chapters prepared by 84 well-known authors. An essential desk reference for assistive technology specialists, teachers, administrators, teacher educators, graduate students, researchers, grant writers, developers, policy makers, resource centers, and libraries. To order online, click on the ADD TO CART button above. Your order will be processed and shipped promptly.